Narrow word limit. Stark design. Rigid guidelines. In just a few words, this is how you would describe an AdWords ad. The most common pitfall for advertisers is to assume that writing AdWords ads is easy. Just because they’re short, it doesn’t make it easy. On the contrary, how brief they are is exactly what makes them so difficult to get right. 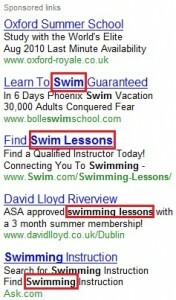 We cover the basics of writing ads in our article “How To Write Your Google AdWords Ads“. On a Google search results page, the search query the user typed for their search appears highlighted in bold, this occurs in both the organic results and the paid results. This helps the user scan the search results page and read the context in which the search query has appeared. Therefore, it’s safe to assume that people would rather click where they’ve seen then words they’ve searched for. This can work in your benefit as an advertiser if you take the time to write ads that include your keywords. 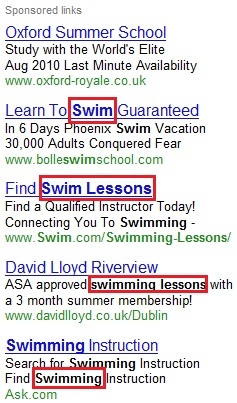 By using the keyword in your ad (body or title) your have an advantage over the competitors who don’t. You can also try keyword insertion. This enables you to create a standard ad for a large group of keywords (this would probably work best with product names), so when your ad appears on a search result page, the code will be replaced by the keyword that triggered the ad. If you have a long domain name (or even a short one) you can make it stand out far more by using capitalisation in your URL. This looks great but is also easier to read too. For example our own web address “www.redflymarketing.com” isn’t as easy to read as “www.RedFlyMarketing.com”. By including prices and several other numbers in your ad copy you can increase your targeted click-throughs. An ad that displays the price of the product stops users that are unwilling to pay that price from clicking on the ad, it reduces unwanted traffic to your site. Also, communicating the price is important to the customer. When a customer is seeking out a product one of the most important pieces of information for them is the price, to determine if they can afford it or not. However, most advertisers fail to display the price of the product quickly enough. If your prices change too often, then you can display your discounts, special offers, promotions and delivery prices instead. Learning to discriminate between a benefit and a feature is a step towards writing better ad copy. The benefits of a product describe what’s in it for you, but the features describe what functions the product performs. These might seem like the same thing, but they aren’t. The coffee I had this morning contained 100 mg of caffeine. This camera has 20x zoom. The coffee kept me awake until next morning. This camera lets me take photos from really far away. The PDF takes only 10 seconds to download. The above tips are the technical features that AdWords ads have to meet in order to produce maximum results. Create a strong connection between your ad and your landing page. This is crucial in maintaining a good conversion rate. Eliminate mispositioned ads. Redefine your target niche if necessary, and use more productive keywords. Eliminate every word that doesn’t bring value to your ad. The word count in AdWords is so tight that there’s no room for “click here”, “see (this link)” and so on. Keep track of your ads, test new ads and remove under-performing ads. Further Reading: We recommend reading How To Use Image Ads and the Display Network next, or pick one of the other tutorial pages below.